It was 1835, and John Otterson was eight years old. Each morning, he was shaken awake at 4 o'clock and given a simple breakfast before walking to the local coal mine, ready to start work at 5am for at least 12 hours. The appalling conditions in which children of this age were treated in the workplace eventually attracted the attention of a British Government Commission, which delivered its report in 1842. John Otterson was one of its witnesses. Above: Part 1 of the Children's Employment Commission report of 1842. The report shocked Victorian society, and in that same year the British Parliament passed the Mines and Collieries Act, which prohibited boys and girls under the age of 10 from employment in mines. THE LIFE OF JOHN OTTERSON began in a coal mining family in the first half of 19th century, and ended with a fall down stairs as a Royal Navy pensioner in Portsmouth 77 years later. Among all the Ottersons who lived in County Durham in the 1800s, John's is one of the best documented and more remarkable stories. John was born in Jarrow, the eighth of twelve children, in the spring of 1827. Two of his elder brothers died before John was born, and two younger brothers died in infancy when he was growing up. The family had lived in Jarrow for only about five years when John was born. John’s father, Nicholas, was from Sunderland, where the family resided for the first eight or ten years after his marriage to Jane Middlemas. It was common for coal miners to move from coal town to coal town, as new seams opened up or as certain mines appeared more promising or the work and living conditions seemed more favorable. Nicholas worked at different periods both as a miner and a sailor - possibly on the coastal vessels of the merchant navy. 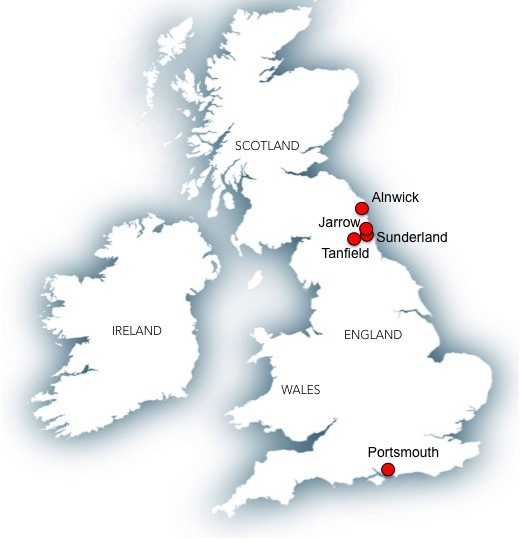 Jarrow lies about 12 miles north of Sunderland, on the south bank of the River Tyne, which then marked the county border. The Otterson home was in Dunkirk Place, a street that roughly paralleled the edge of the river, and from where father Nicholas could easily have walked to work at the Jarrow Colliery and where he would also have had easy access to the docks. This was where John was born. He was christened at St. Paul’s, an ancient church and monastic site, part of which dates back to 681 A.D. and which is even today Jarrow’s most noteworthy feature. Before John was eight years old, his father took work at Monkwearmouth Colliery, which stood at the heart of the growing city of Sunderland. It would have been a homecoming of sorts for Nicholas. But at an age when most children today are beginning to make their first firm friends in school, John entered the mine as a door-keeper on the barrow way. His two older brothers had already preceded him into the colliery. The barrow ways had been used in Durham mines for centuries. Originally, woven baskets full of coal were dragged from the coal face through tunnels. Later, small wheeled push-carts replaced the baskets and rail lines were laid to speed removal. 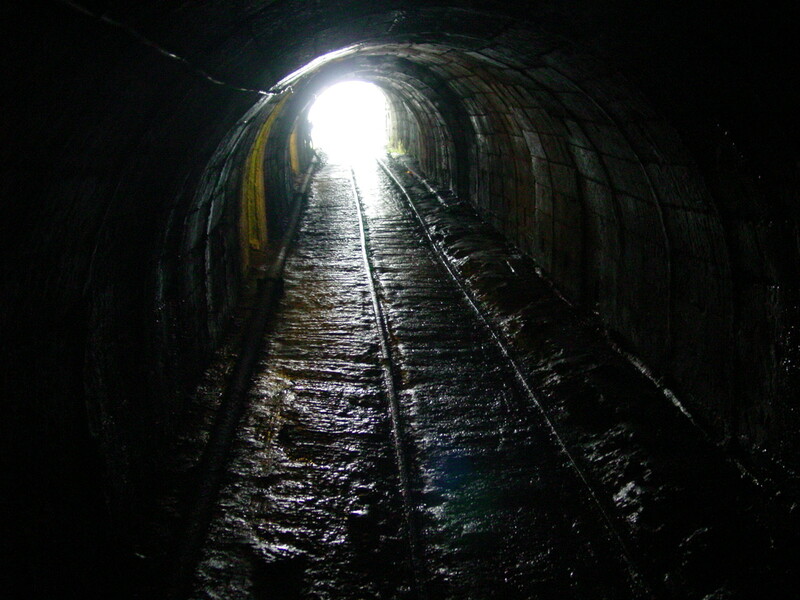 The boys in some of these mines would enter a mile deep to do their work, at times operating in complete darkness. It is difficult today to understand how the shocking conditions in which these children labored could be tolerated. In fact, it was a matter of survival for many families. A man might work at the coal face, in cramped positions for hours, or even lie flat on his back or side while he chipped away at the coal face. He was paid by how much coal he could load into a tub, and many men were assisted at the face by wives and children who would load the tubs and help move them to the surface. Sometimes men would work in those conditions stripped of all clothing, and wives too would work stripped to the waist. 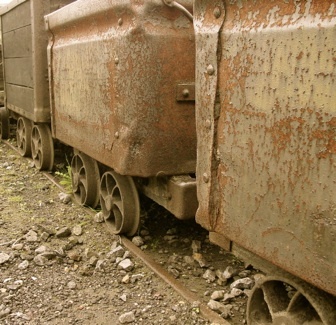 Interestingly, the government’s investigation into conditions in mines for children was partly the result of public outrage at the morality of this environment. In 1842 the British Government published a report on the findings of the Children’s Employment Commission. Among many children from different parts of Britain who were interviewed was 12-year-old John Otterson. His testimony is a remarkable insight into how the Otterson family and their neighboring mining families were living in 1840s England. Witness number 116 in the published report, the complete text of his testimony follows. Some of the language and terms of the time are unfamiliar to modern eyes, and a guide to unfamiliar terms appears alongside. Below: Child miners. Even after the parliamentary report of 1842, children over the age of 10 still were allowed to work in the mines. The work was hard and dangerous, and children were frequently injured. I got up at ten on days when we did not work. On Sunday I went to the Sunday school at one o’clock, and spent three hours in school, and then came home. I did not then go to chapel. I went to bed at seven to get a good load of sleep, for fear of falling asleep and getting lamed next day at work. I got 10d a-day as a trapper. After half a-year I went to drive a galloway. I liked it badly; it was as a help up. The galloway was yoked to a tram to draw it up the bank, where the road rose up. I had to walk on foot at the horse’s head; it was fatiguing; there was 12 hours’ work. I had time to take my bait; not always; it was a time of chance. I was half a-year at this work, and got 1s a-day. I then went to drive the waggons and got 15d a-day. I had time for my victuals, sometimes. There is often a plate in the way, which throws the waggon off the rail, and we get lamed. I have been lamed three or four times; I was laid up three months one time for lameness. I got smart money. I am now a driver; I like it very badly. I would work on foot if I had daylight to walk in, rather than ride in the dark. I do not like the darkness; it is dangerous; many are hurt. I cannot read very well. I cannot write my name. I try to read the spelling-book. I cannot say the Lord’s Prayer, nor the Catechism, nor the Ten Commandments. I was at work to-day till half past four. There are sometimes few and sometimes many in the tub when we come up. The tub this night was full; I got my head knocked against the side of the tub, it was so full. I went straight home. It wanted then 20 minutes to 7. John’s bride was 20-year-old Isabella Kane, who was literally the girl next door in Stafford Street, Southwick - then a distinct village but now a Sunderland suburb. Isabella’s father was a soldier who had died a month before the wedding, but two of Isabella’s brothers were also miners. The Ottersons’ first child, a daughter, arrived the following year and they named her Sarah Jane. By the time their second daughter, Elizabeth, was born in 1855 the small family had moved to Tanfield, a village seven miles south-west of Gateshead. New mines were opening in the area as the other coal seams along the banks of the Tyne River were gradually worked out. During this period three Tanfield mines employed some 1,200 men and boys, a substantial proportion of the village population of around 3,500 in 1850. By his late twenties, however, John Otterson had had enough of coal mines. If the feelings revealed by his teenage testimony accompanied him into adulthood, he was glad of the opportunity for a dramatic change in career. The Royal Navy, which then enjoyed unchallenged supremacy at sea, was on the point of transitioning from sail to steam. John Otterson would soon become a part of that historic transition as a navy stoker, a move that would take him around the world. 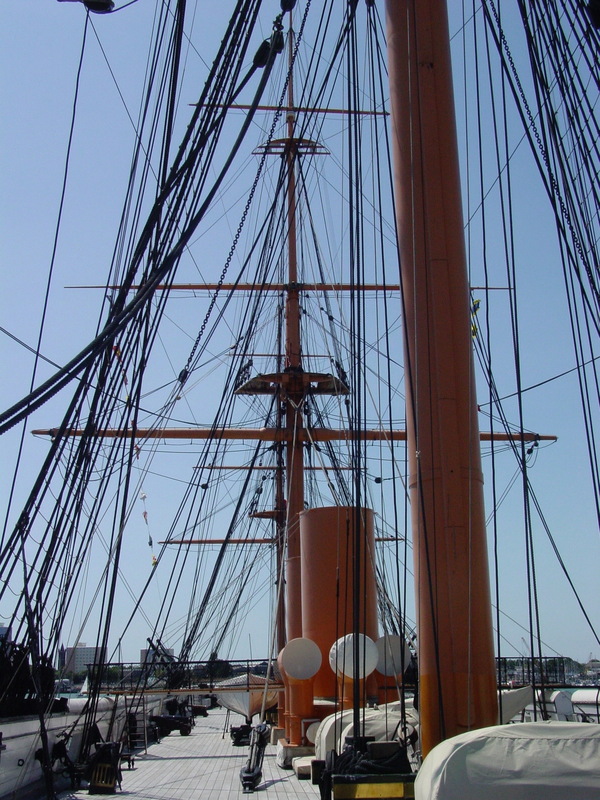 Above right: The deck of HMS Warrior, now a museum in Portsmouth. The ship was built at the transition from sail to steam, and used both as propulsion. As the 1850s drew to a close, John Otterson made a major change in his life, leaving the coal mine and joining the Royal Navy. It was a change that would take him all over the world. For an ex-coal miner, there was an obvious job on board ship. The British Navy was transitioning from ships that were entirely dependent on wind, to those with screw propellers driven by steam. The new propulsion system required shovelling coal into rows of furnaces in the bowels of the ship, and the men that did the hot and dirty work of stoking the furnaces were called stokers. At first, ships built by the British Admiralty had both wind and propeller, and the screw could be lifted clear out of the water when relying on wind alone. John Otterson received his navy uniform when he joined the 74-gun Minotaur as stoker 2nd class on 5 Aug 1859. His navy records say that his complexion was ruddy, eyes blue, hair brown, he had been vaccinated, was married, and was formerly a miner, and belonged to the Church of England. It is significant that he joined the Minotaur as a stoker. The ship, one of a half dozen in British history to carry the name Minotaur, had been built as a wooden vessel propelled by sail, launched in 1816 at Chatham Dockyard. She should not be confused with her predecessor which fought in the Battle of Trafalgar, nor with the iron-clad battleship of the same name which followed her. HMS Minotaur had, in fact, been placed on harbour service in 1842. But in the late 1850s there was serious discussion of possible invasion by France, and the British Admiralty had ordered the conversion of more than 60 wooden warships. 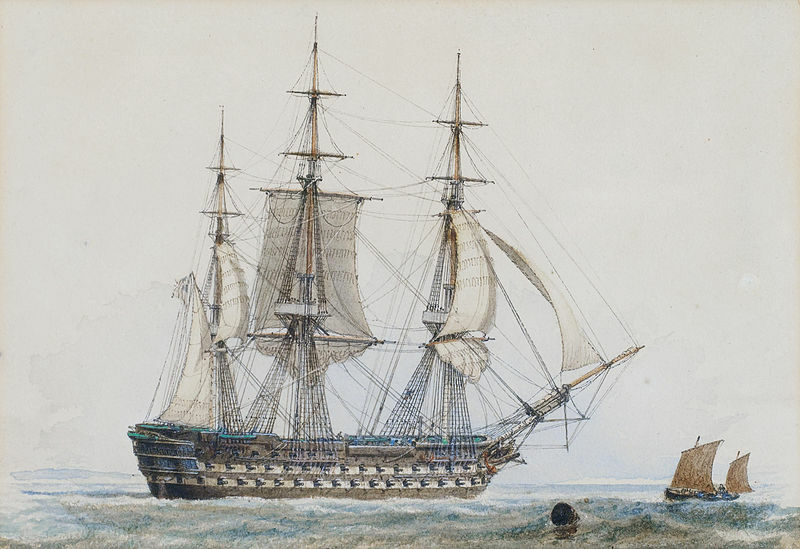 According to the Royal Navy muster books and ships’ logs at the National Archives in London, John stayed on the Minotaur less than two months, until 30 September, 1859, when he transferred to HMS Cumberland, a 70-gun man o’ war. Cumberland was serving as a guard ship at Sheerness on the Thames Estuary, protecting the fleet in harbour. 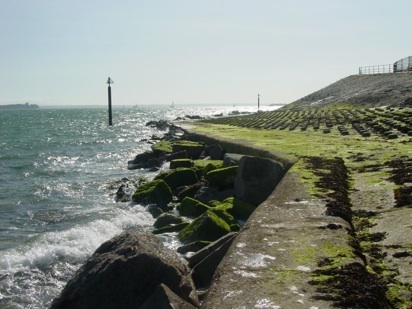 Sheerness itself was one of the bases of the Royal Navy responsible for safeguarding British waters in the North Sea. Three different captains on Cumberland - Hatten, Schomberg and Thompson - each rated his behavior as “very good,” unlike some stokers who seemed to be forever in the cells for misbehaving. 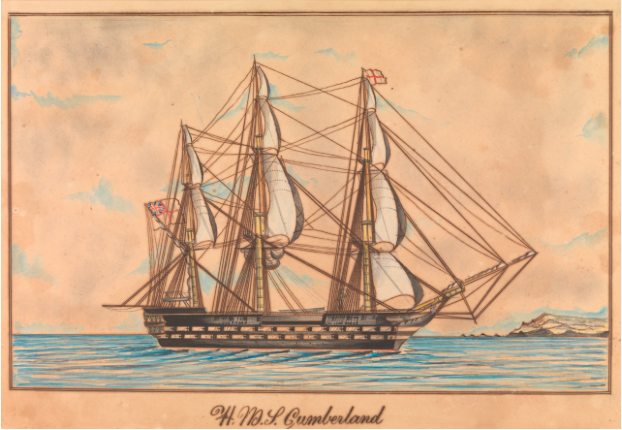 When the next English census was taken on the night of Sunday, April 7, 1861, John Otterson was still aboard the Cumberland, serving as a stoker. Both the census and ship records give his age as 29, but he was actually closer to 33. It’s likely he understated his age when joining the navy. Interestingly, John’s wife Isabella and the two children are on board the same ship, listed as passengers. While it was not uncommon in the British navy to have wives aboard, the presence of the children is interesting but unexplained. In July of the following year, John Otterson transferred to HMS Rattler at Sheerness. Rattler was an entirely different ship that the Cumberland. She was a new wood screw sloop, launched in 1862, but not to be confused with her predecessor of the same name which has a permanent part in British naval history as the first ship to demonstrate the effectiveness of the propeller propulsion system. That ship was decommissioned and broken up in 1856. From Sheerness, Rattler sailed for the far east, as her predecessor had done. More noteworthy than stoker John Otterson, she had on board an interpreter to the legation. The Far East had become an extremely important sphere of influence for the British Government, and the Royal Navy was its primary instrument. John was still with HMS Rattler when he became leading stoker on 27 Aug 1865. He went to the Far East on Rattler with captain Howard Webb, sailing back and forth between the ports of Hong Kong, Singapore, Penang, Malacca, Swatow, Yokohama, Shanghai, Kobe Bay, Castries Bay, Novgorod, Soya, and La Parouse Strait which separates the northern Japanese island of Hokkaido from Russian territory to the north. John could not have known at the time, but his promotion to leading stoker on August 27 was just days before his wife, Isabella, died in England of gastroenteritis, possibly from food poisoning. She was buried at Mere Knolls Cemetery in Sunderland, on September 3. A neighbour and presumably friend, Ellen Dobson, was with Isabella when she died, and interestingly reported to the registrar that John was a coal miner. Perhaps she simply knew that John was still shovelling coal even in the navy. It would have taken some time for word to reach John in the Far East, but four and a half months later, on 16 January 1866, he was discharged from Rattler to HMS Princess Charlotte to await passage back to England on Orontes. Again, his conduct was recorded as “very good.” John’s return and the feelings for his two daughters must have weighed heavily on him. 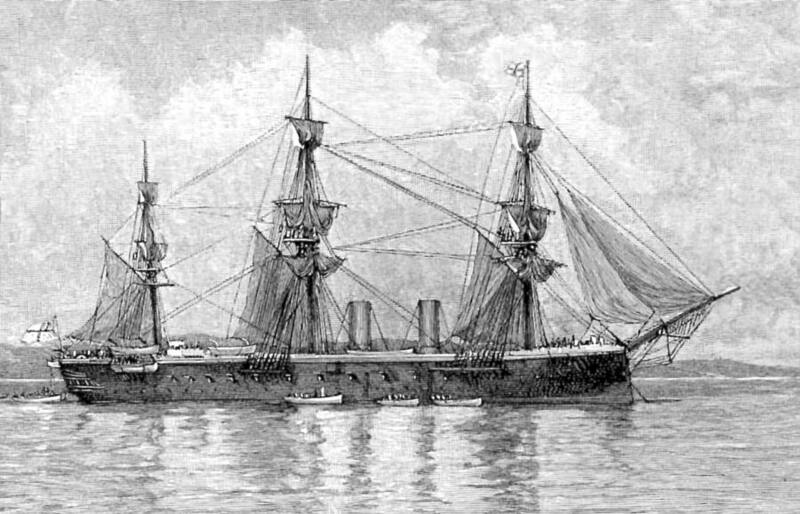 (Ironically, Rattler was subsequently wrecked on a reef off the Japanese coast of Hokkaido in 1868, although the crew survived). John spent the next period around English shores, notably on the Indus which operated out of harbours in Plymouth as a guard ship. Indus was moored at Keyham, a suburb of Plymouth which was built to provide dense, cheap housing for thousands of civilian workmen just outside the wall of the dockyard at Devonport. The Indus log shows parties of stokers being sent off to coal various ships coming in or out of harbour and working parties going ashore to the dockyard. 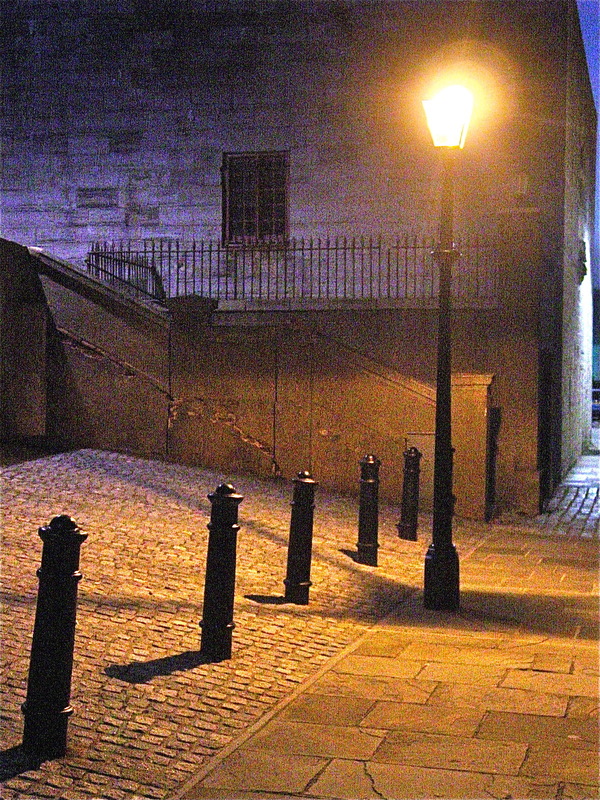 Most evenings there is the entry “Rowed Guard”, then “boats up.” Every ship entering or leaving harbour was noted in the log. On 15 May 1869, John transferred from the Indus to HMS Inconstant, an iron-screw frigate he was to stay with for nearly ten years. Although she was steam-assisted, she was fully masted and capable of over 16 knots. John joined her as a leading stoker. Her base was Spithead, Portsmouth, and it was here that John met a widow, Rebecca Wilson, whom he married in the summer of 1870. The 1871 English census lists him as “borne on the books” of the Inconstant but “not on board”. In fact, he was staying with his new family at the their home in Yorke Street, Portsmouth, which was walking distance from the docks. Apart from his wife, Rebecca, whose age is given as 41 (John lists his own age correctly as 45), there were three step-sons and a step-daughter, as well as Rebecca’s 81-year-old mother. At this time his natural daughter, 17-year-old Elizabeth, had also joined the family. Her elder sister, Sarah, 18, was working as a domestic servant for a ship’s broker in Sunderland. By the end of the following year, both of John’s natural daughters were married. Painting by John Ward of Hull (1798-1849). Public domain. HMS Cumberland and HMS Inconstant, two of the ships on which John Otterson served. 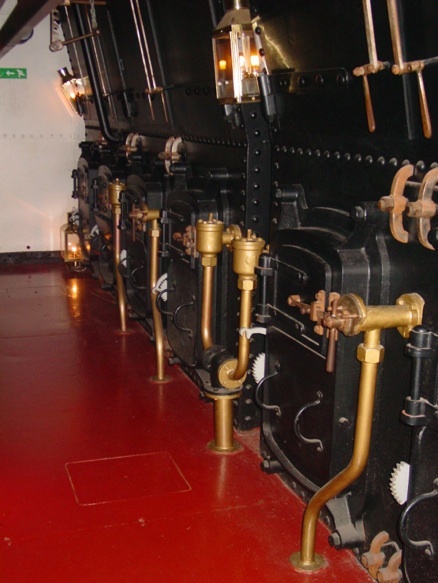 Rows of coal-fired furnaces drove the screw propeller on later 19th century ships. These furnaces would have been "home" to John Otterson and other stokers on Royal Navy ships. This picture was taken on HMS Warrior, now a museum ship in Portsmouth. 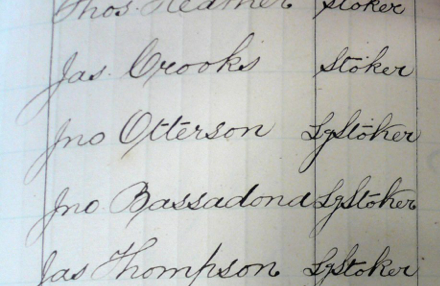 John Otterson’s name listed for transfer as a leading stoker to HMS Asia, October 1878. HMS Asia, which mounted 84-guns on two decks. Left: Map of Portsmouth in the 1800s. Middle Street was where Rebecca Quick lived with her first husband and children before he died. 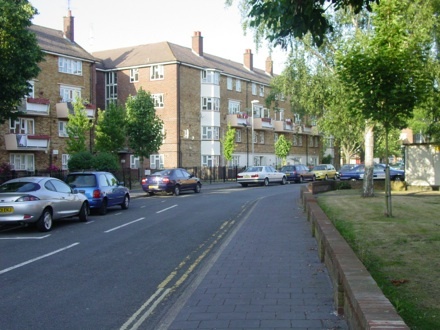 The family lived with second husband John Otterson in Yorke Street. 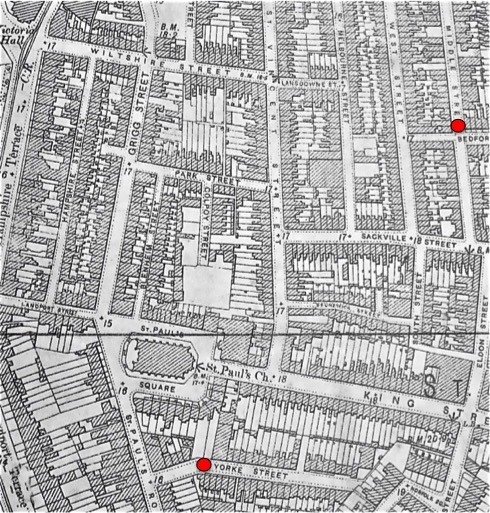 Both streets still stand today, despite heavy bombing of central Portsmouth in Word War II. Movements of the ships mentioned on this page were taken from the log books in Class ADM at the National Archives, London, by Margaret Otterson Seabourne, 2009. John Otterson’s transfers are taken from muster books for these ships. In his first three years with Inconstant, John patrolled the Atlantic, the Mediterranean and the Baltic. He was off Lisbon during 1869-70. In 1871, Inconstant was part of the Detached Squadron of six ships which went to Madeira, Gibraltar, Karlskrona, Christiania and Bergen before returning to Spithead via Scotland in October of that year. In 1872 John sailed to Bombay in India, and then Simon’s Bay in South Africa, and again back to Spithead. There were about 600 men on board. Sometimes they carried a Vice Admiral, or "supernumerary marines" being transferred to different stations or ships. John Otterson retired from the Royal Navy and drew a navy pension from his early 50s. He and Rebecca enjoyed a long retirement. From Yorke Street they moved to St John Street, Portsea, then 45 Arthur Street, their last home. On the night of 17 June 1904, John took a fall on the stairs, struck his head and died the next day. He was 76, though his death certificate said 81. Rebecca, survived him for four more years and died naturally of old age in 1908.